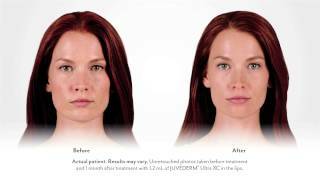 Juvederm ® - Look Younger Without Surgery! Juvederm ® - Be younger without surgery! Juvederm ® - Lift and Contour Cheeks - Turn back the clock! 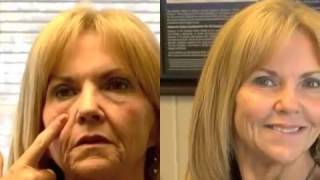 Look 10 years younger without surgery in 20 minutes! The Aging can be solved instantly with Fillers such as Juvederm family of products made by makers of Botox Cosmetics..
is a family of injectable hyaluronic acid dermal fillers used to provide 9 months to one year of correction for moderate to severe facial wrinkles and folds, such as nasolabial folds (lines from the nose to the corners of the mouth). JUVÉDERM® XC is the smooth gel filler to instantly smooth away wrinkles around your mouth and nose. With just one treatment, you’ll get smooth and natural-looking results that last up to a year.Juvederm is a dermal filler introduced to the U.S. market by Allergan, the company which manufactures BOTOX®. It is made of hyaluronic acid, a substance that is naturally produced in the body to hydrate the skin. 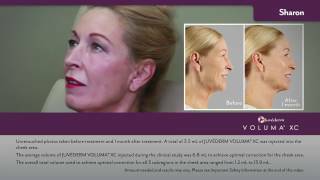 APPROVED USESJUVÉDERM VOLUMA® XC injectable gel is for deep injection in the cheek area to correct age-related volume loss in adults over 21. At CosMedic Laser Clinic, Dr. Neema Malhotra uses above Juvederm products and Botox to do non-invasive facelift to correct age related volume loss and enhance cheeks, lips, correct facial wrinkles, folds and contours. JUVEDERM® is a product of Botox® Cosmetic, sometimes called "a facelift in a bottle" or “liquid facelift”, is a purified protein. Juvederm® filler treatments take about 20 minute and unlike surgery it is fast, simple and minimally invasive. Juvederm injection is done with a very fine needle and anesthesia is often not required as the procedure is virtually painless. For persons who are very sensitive to pain, the local anesthesia can be is used to avoid injection discomfort. Because Juvéderm™ injectable gel is a simple, nonsurgical treatment, there is minimal recovery or downtime. So you can make an appointment to stop by for treatment on the way to work or to home or to the gym, or during your lunch break or even while the kids are at soccer practice-and get right back to your life. Parentheses have a place — but not on your face ! Some people simply have naturally thin lips and just want to achieve a fuller appearance. Other people have noticed their lips thinning over time and may also have seen vertical lip lines become more noticeable. Whatever your unique needs are when it comes to your lips, the JUVÉDERM®collection may be able to help. Over time, your skin loses elasticity and moisture, which contributes to moderate to severe parentheses lines and wrinkles around the nose and mouth. While serums and creams can help moisturize the skin’s surface, but cannot make the volume loss due to aging. The fillers can add the volume back and turn back the clock. JUVÉDERM® XC adds volume to smooth these lines and folds, to help give you the natural-looking, long-lasting results you want. The filler can normally last for a year. The JUVÉDERM® collection offers two formulations for the lips that last one year. 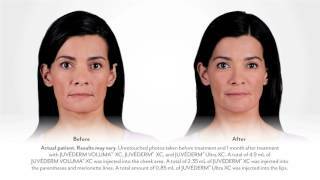 JUVÉDERM® Ultra XC adds more fullness and plump while. JUVÉDERM VOLBELLA® XC is to add subtle volume to the lips and smooth the appearance of vertical lip lines. Get the Deal... Savings are just the beginning. One of the risks with using this product is unintentional injection into a blood vessel, and while rare, the complications can be serious and may be permanent. As with all skin injection procedures, there is a risk of infection. If you are seriously considering non-invasive quick face lift; call CosMedic Laser Clinic for FREE consult with physician to see what filler is best for you. Juvederm injection is done with a very fine needle and anesthesia is often not required as the procedure is virtually painless. For persons who are very sensitive to pain, the local anesthesia can be is used to avoid injection discomfort we would love to share more information and answer your questions in person. Call us at (408) 945-0400 today to schedule your FREE consultation. If you're considering a wrinkle treatment and are interested in understanding how Juvederm® or Botox® can help you look younger and healthier we invite you to call us at 408-945-0400 to Book a FREE consultation..